Scientists have developed a do-it-yourself flu vaccine that could be sent to patients in the mail. During last year’s deadly flu season, hospital waiting rooms, clinics and pharmacies overflowed with people waiting both to get a shot against the flu and to get treated. In fact, by mid-winter, many major providers had run out of the shot altogether, leaving millions of Americans unprotected, either because they did not want to get vaccinated or because it wasn’t available. But the new vaccine that University of Washington researchers developed could be delivered through a Band-aid-like patch that requires no training to use, is so far safe for animals and humans, and could be shipped right to your door. The 2017-2018 flu season turned historically deadly. Vaccinations to prevent the virus were estimated to only be about 30 percent effective, which may have dissuaded many Americans from getting the shot, and provided limited protection. Typically, vaccines are developed based on whichever of many possible strains scientists think will be dominant in a given season. But that means it only protects against a fraction of all flu viruses – and any mutation can render it ineffective against even the one it best targets. Scientists, including lead study author Dr Darrick Carter, have long aimed to make a vaccine for many or even all strains of the virus. ‘That’s sort of the holy grail of the flu vaccine: if we could make a vaccine that could protect against viruses not in the vaccine and have a broader flu vaccine,’ he says. Dr Carter and his team weren’t even planning to make such a shot. Their initial goal was to bring to life an idea from the Defense Advanced Research Projects Agency (DARPA). With worries over the H5 Indonesian flu pandemic, ‘the thought was that even if we had a stockepiled vaccine that would protect against that, people would start congregating at these health centers, and that’s the perfect place to infect each other,’ Dr Carter says. So their goal was to make a vaccination that worked as well as current vaccines, but that could be administered at home. They needed to choose both an instrument and an adjuvant – the actual immune system-boosting drug – that could accomplish this aim. The end result was an adjuvant that could be delivered transdermally, using a much shorter microneedle, or even a transdermal patch that looks like a band-aid, has many very small hollow needles, and can barely be felt. In terms of how many strains the vaccine had the potential to prevent, ‘we were shooting for on-par, but found that it’s actually superior,’ Dr Carter says. Though nearly all shots are injected into the deeper muscle layer, shallower transdermal vaccines actually make a lot of sense. Dr Carter explains: ‘If our ancestors were wondering through the forest, very rarely do they stumble and a stick goes into the the muscle, mostly we would get scrapes,’ that could get infected. ‘So a large portion of the immune system is close to the surface and when you give a normal shot, it actually bypasses those places,’ Dr Carter says. In tests on both ferrets and humans, the transdermal shot was safe, and protected against a number of flu virus strains. ‘If it illicits a broader immune response, it can stop more viruses, even if it is not perfectly matched,’ Dr Carter says. Deeper shots have persisted mostly as a matter of ‘inertia,’ he adds. Though their experiments used a of a microneedle – that still requires a trained professional to administer – and multiple small needles, Dr Carter says a patch would be the ideal delivery method. 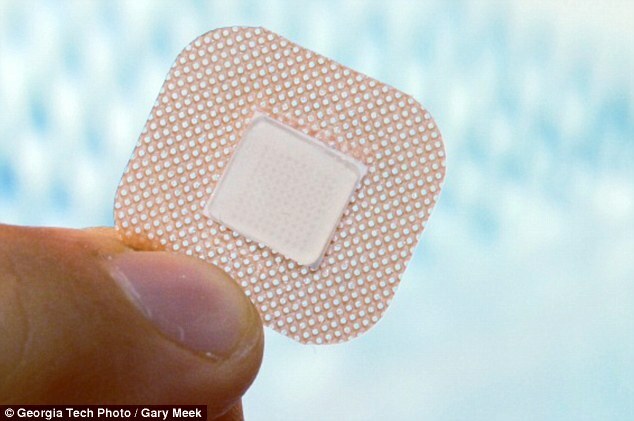 Patch microneedles ‘are the future,’ says Dr Carter. All the components of a vaccine – flu or otherwise – can be dried into the patches, which are ‘now indistinguishable from band-aids. You probably wouldn’t feel it and could take it off in a minute or two,’ Dr Carter says. These are already in use for tuberculosis tests as well. Right now, while these types of vaccine are still in development, they’re still more expensive than the current flu shot, but Dr Carter speculates that eventually the cost will be about the same. ‘There’s been a little weariness in the field because people have been trying to make these for so long, and we’ve had all these great results and no real product,’ he says. Manufacturing has caught up, but realistically, we’re still probably 10 years from having the flu patch vaccine on the market.